Soak up the history, feel the passion and see Celtic Park like never before with a 60-minute guided stadium tour. Take the route of legends from the dressing room down the tunnel, sit in the dugout and take in the atmosphere pitch side. Celtic Park is one of the biggest football stadiums in Europe, making it the perfect place to learn all about the colourful history and heritage of Celtic Football Club from its inception in 1888. Experience first hand, Celtic's heritage and culture that has made the club famous and renowned the world over. Take a guided tour of the stadium as well as taking a trip through the history of the club through our various informative and impressive exhibitions. We recommend booking your tour in advance of your visit to the stadium to avoid disappointment should the tour be full on arrival. Visitors are advised that the tour will entail a degree of walking and climbing steps and are advised to wear appropriate clothing and suitable footwear. Car access to the stadium is via Janefield Street off Springfield Road, please drive under the North stand and bear left parking in the car park near to the Superstore. The entrance to the stadium tours is to the left of the main reception in the South Stand. 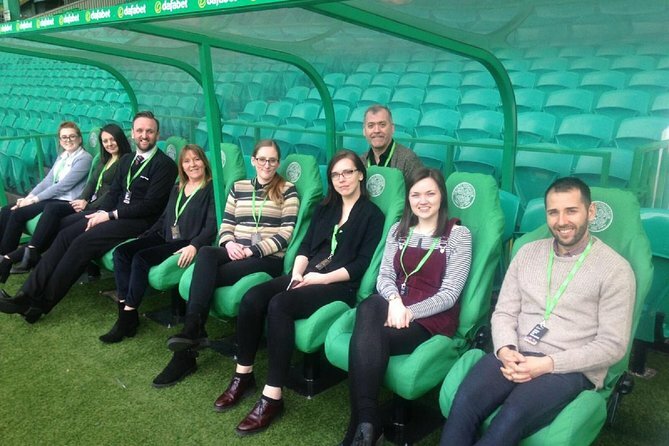 Your tour with include a visit to the home team dressing room and Celtic FC Boardroom before walking in the footsteps of legends down the tunnel, sitting in the dugout and taking in the atmosphere pitchside. Please be aware that as Celtic Park is a working stadium, The Tour route is subject to availability, cancellation and alteration at short notice and certain parts of the stadium may be inaccessible to Stadium Tours without notice being given. As such no refund or compensation will be given to tour customers if this occurs. Please note there is no left luggage facility at the stadium, therefore guests should refrain from bringing any large bags with them that they cannot carry. Please note all bags entering the stadium, including purses, are subject to inspection by staff. Dressing room access on the day of a match and the day before a match may be restricted dependant on first team activity at the stadium. These timings cannot be confirmed in advance. The tour start location is to the left of the main reception in the South stand of the stadium where you will be met by the tour guide. Car access to the stadium is via Janefield Street off Springfield Road, please drive under the North stand and bear left parking in the car park near to the Superstore. The company may cancel a stadium tour at any time to fulfill football fixture list requirements. In this case a full refund will be given. Tour and Dine package includes 60 minute stadium tour followed by 3 course meal in a restaurant at Celtic Park. Adults booked for Tour and Dine will dine from the 3 course carvery menu which includes a choice plated starter brought to your table, followed by a single visit to the carvery station for main course and single visit to the dessert station for dessert. Children booked for Tour and Dine will dine from 3 course kids menu with a choice starter, main and dessert all brought directly to your table. Children booking Tour and Dine must be 12 and under. Please note Tour and Dine does not include any drinks and all outstanding charges for drinks, tea, coffee and extras requested in the restaurant must be settled before departure.